I was recently tagged by the lovely Zena in a tag called The Blogger Interview. 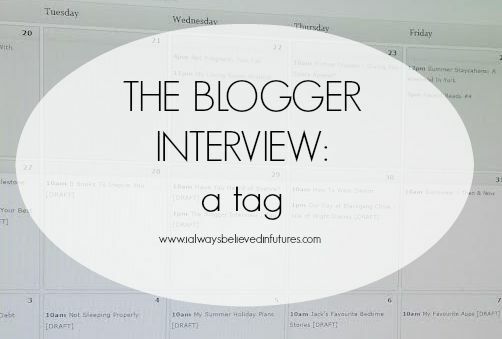 In the tag, a few different questions are asked about blogging and you have to give your answer. I love blogging and being a blogger so I was excited to be tagged. What will my answers be? I love the community and the landscape has changed so much since I started – I’m not even sure what my answers will be myself. Here goes. Well I had actually been blogging for years on and off – on various platforms including Xanga, Livejournal and Blogger. Typical teenage emo ramblings usually but a blog nonetheless. When it came to this blog, I was reading a few at the time and was considering starting up again (Sarah’s blog was a huge inspiration in getting me started again) when a few of my friends from a Facebook page I frequented started up. I decided to bite the bullet and here I am 4.5 years later with some of those girls from that page still my friends (and some of my best friends too) and with my inspiration becoming one of my best friends too! Do your research. Really think about your URL and blog name and which platform you want to have your blog on, whether you want to go self hosted or buy a vanity URL or simply just keep the .blogspot or .wordpress in your URL. Work out what it is you want from your blog and set out to achieve it from the beginning – it can be hard to change everything over later on (but not impossible). Another thing I would suggest is obviously people start their blogs for different reasons. If you are starting your blog to review ‘free’ products (never free as you have to test the product, write a review, take pictures, promote etc) and/or make money off your blog, don’t expect it all to fall into your lap straight away. You will need to put the work in. You will need to interact with the blogging community and get yourself out there. By expecting everything to happen straight away and not getting involved in the community, you risk setting yourself up for a fall and alienating a very helpful and kind community. Well…when I started this blog 4 and a half years ago, it was predominantly beauty content. Then once Jack started being more active, it became more of a parenting blog. Now I like to think I’m in the middle ground between a lifestyle blog and a parenting blog – I like to write about Jack and being a mum but I’m not just a mum, I’m so much more. I’ve also got my .com address, moved from Blogger to WordPress, started making a semi-income from my blog and so much more. It sure has been a learning journey! I can’t deny that a holiday campaign would be amazing – I’ve already reviewed within the UK at Bluestone – but an international trip would be amazing. But who am I kidding, I would love to go to the Harry Potter studios at Leavesden. I live so close yet still haven’t gone! Be clear about what you want from me. Use my name and make sure it is the right one. Don’t waste my time by skirting around certain questions – say yes/no and we will all know where we stand. I think most people would be lying if they said they didn’t. I would love to continue getting my blog out there, making more blogger friends and continue making a semi income from it too. I think they can be useful in some respects but it is far too easy to get hung up on the numbers. Just because one website says that person is number 1 and not you and then another website says someone else, it doesn’t mean you aren’t worthy. It is useful to see how you are getting on but don’t focus on them too much. Always such a fun topic to read about! Great advice about picking the right name and URL, I am still happy with mine, but I know so many people aren’t. Really interesting questions and answers. Blogging seems to change all the time – it moves so fast. What a great tag and so interesting to find out more about the authors of blogs that we read! I think it’s true that many don’t realise how much hard work is involved with blogging. Blogging is changing all the time, and I completely agree about picking the right name. I have recently switched and feel like it’s a better fit/direction. Great advice for PR. I hate when I get an email and my name or my blog is incorrect; it really drives me mad. Love reading about when people started blogging. I was into crafting and pretty blogs and then it went from there to thinking I could do this too. Love our community. Really interesting read! I have followed a similar path to you – blogger then wordpress, vanity url and all that fun and games! I dont have a plan tho – am hopeless at them! I wish I knew more about blogging when I first started! I guess it is a learning journey all along. Great post!